California’s Central Valley covers about 20,000 square miles and is one of the most productive agricultural regions in the world. More than 250 different crops are grown in the Central Valley with an estimated value of $17 billion per year. This irrigated agriculture relies heavily on surface-water diversions and groundwater pumpage. Approximately one-sixth of the Nation’s irrigated land is in the Central Valley, and about one-fifth of the Nation’s groundwater demand is supplied from its aquifers. The Central Valley also is rapidly becoming an important area for California’s expanding urban population. Since 1980, the population of the Central Valley has nearly doubled from 2 million to 3.8 million people. The Census Bureau projects that the Central Valley’s population will increase to 6 million people by 2020. This surge in population has increased the competition for water resources within the Central Valley and statewide, which likely will be exacerbated by anticipated reductions in deliveries of Colorado River water to southern California. In response to this competition for water, a number of water-related issues have gained prominence: conservation of agricultural land, conjunctive use, artificial recharge, hydrologic implications of land-use change, and effects of climate variability. 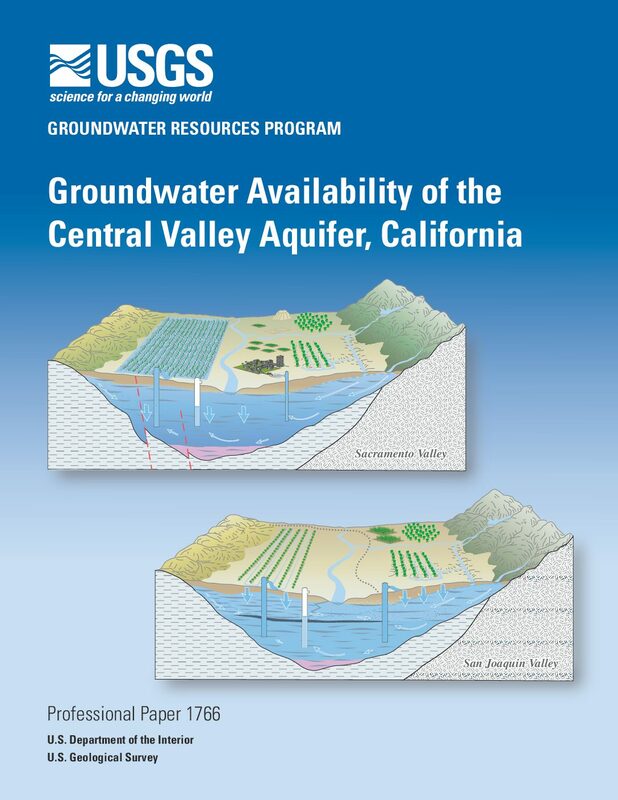 To provide information to stakeholders addressing these issues, the USGS Groundwater Resources Program made a detailed assessment of groundwater availability of the Central Valley aquifer system, that includes: (1) the present status of groundwater resources; (2) how these resources have changed over time; and (3) tools to assess system responses to stresses from future human uses and climate variability and change. This effort builds on previous investigations, such as the USGS Central Valley Regional Aquifer System and Analysis (CV-RASA) project and several other groundwater studies in the Valley completed by Federal, State and local agencies at differing scales. The principal product of this new assessment is a tool referred to as the Central Valley Hydrologic Model (CVHM) that accounts for integrated, variable water supply and demand, and simulates surface-water and groundwater-flow across the entire Central Valley system. The development of the CVHM comprised four major elements: (1) a comprehensive Geographic Information System (GIS) to compile, analyze and visualize data; (2) a texture model to characterize the aquifer system;(3) estimates of water-budget components by numerically modeling the hydrologic system with the Farm Process (FMP); and (4) simulations to assess and quantify hydrologic conditions. 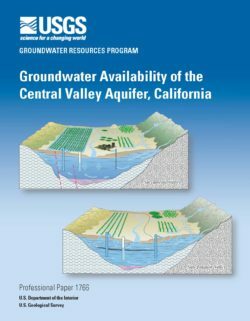 The purpose of this report is to describe groundwater availability in the Central Valley. The descriptions are derived largely from the study results, including modeling; however, they also utilize the extensive literature on California’s Central Valley. The report comprises three chapters and an appendix. Chapter A (this chapter) summarizes the study’s purpose and scope and provides an overview of the hydrogeology of the study area. The hydrogeologic description includes the geologic framework and regional groundwater-flow. 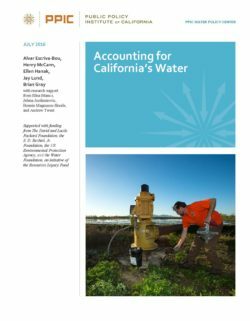 Chapter B describes an analysis and assessment of groundwater availability in the Central Valley—the principal focus of this report. Included in Chapter B are descriptions of the effects of development on the flow system, groundwater sustainability and management, and monitoring of the groundwater system. Chapter C documents the development of a three-dimensional (3-D), finite-difference numerical model of the Central Valley regional groundwater-flow system. This model is used to evaluate the groundwater availability described in Chapter B. Relative to the previously developed Central Valley Regional Aquifer System Analysis (CV-RASA) model (Williamson and others, 1989), the current model was extended to incorporate a slightly larger geographic area (fig. A1), has a finer spatial and temporal discretization, uses a more-detailed depiction of subsurface geology, and simulates monthly water budgets for April 1961 through September 2003. 3. Quantify the Central Valley’s groundwater-flow system to enable the forecasting of system response to stresses from human and environmental stresses at scales relevant to water-management decisions. The Scott Valley is an agricultural groundwater basin in Northern California, within the Scott River watershed and part of the much larger Klamath Basin watershed straddling the California-Oregon border. The Scott River provides important habitat for salmonid fish, including spawning and rearing habitat for coho and fall-run Chinook salmon and steelhead trout. Sufficient flows at adequately low temperatures during summer, for rearing, and fall, for spawning, are critical for healthy fish habitat in the mainstem and tributaries. 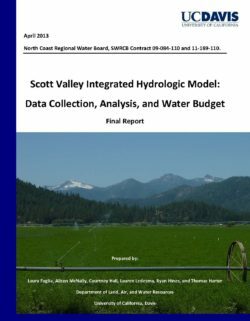 This report presents the data assembled and the methods used for data analysis and data modeling to prepare the Scott Valley Integrated Hydrologic Model Version 2, which is currently under development. 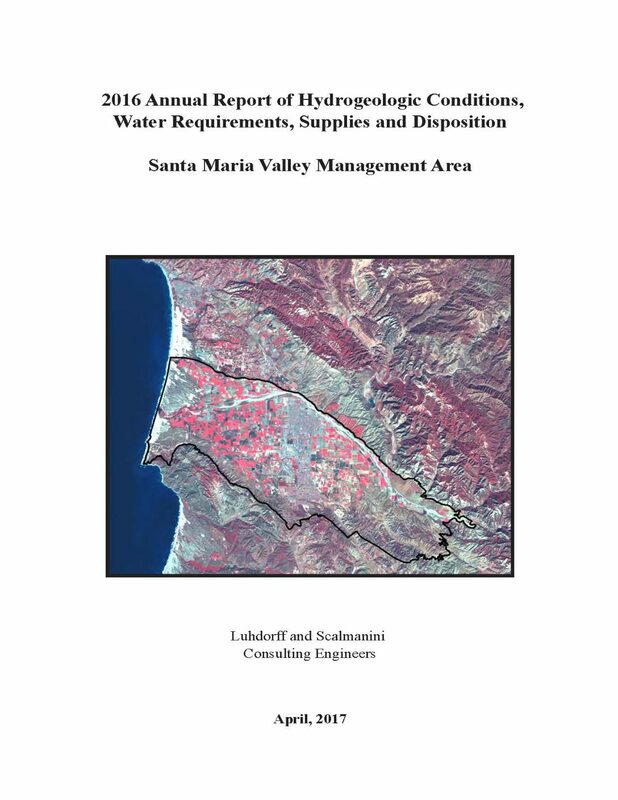 The report includes precipitation data analysis, streamflow data analysis and modeling, geology and groundwater data review and analysis, evapotranspiration and soils data analysis, and preparation of relevant watershed, land use, topography, and irrigation data. The data collection and analysis efforts culminate in the development of a spatio-temporally distributed soil water budget model for the Scott Valley. The soil water budget model is used to determine spatially and temporally varying groundwater pumping rates, surface water diversion rates, and groundwater recharge across the groundwater basin. The spatial resolution of the soil water budget model is by individual fields (land use polygons). Temporal discretization is in daily time steps for the period from October 1, 1990 to September 30, 2011. This period includes several dry years, average years, and wet year periods. Methods and results of the soil water budget model are presented in this report. This report represents the next step toward a better understanding of the interactions between groundwater, surface water, land-use, and agricultural practices with a specific focus on the seasonal impacts of groundwater pumping on streamflow during critical low flow periods. The work presented here relies on an extensive data collection facilitated by the voluntary and active collaboration of communities, landowners, the Scott River Watershed Council (SRWC), the Siskiyou Resource Conservation District (SRCD), and the Scott Valley Groundwater Advisory Committee (GWAC) which has been appointed by the Board of Supervisors in January 2011, meeting monthly since April 2011 and advising UC Davis on its data collection and modeling efforts. In the data analysis and during the model development, numerous assumptions have been made as is common in building a conceptual and numerical integrated hydrologic model. Models cannot represent the complexity of the real system, but are an effort to capture salient hydrologic features with sufficient accuracy to develop modeling results that are useful for a better understanding of the watershed dynamics and water balance. The objective of this Best Management Practice (BMP) is to assist the use and development of water budgets. 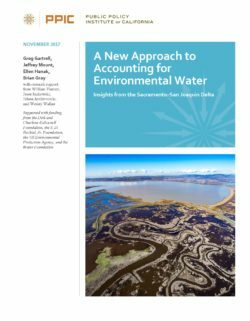 The Department of Water Resources (the Department or DWR) has developed this document as part of the obligation in the Technical Assistance Chapter (Chapter 7) of the Sustainable Groundwater Management Act (SGMA) to support the long-term sustainability of California’s groundwater basins. Information provided in this BMP provides technical assistance to Groundwater Sustainability Agencies (GSAs) and other stakeholders on how to address water budget requirements outlined in the Groundwater Sustainability Plan (GSP) Emergency Regulations (GSP Regulations). 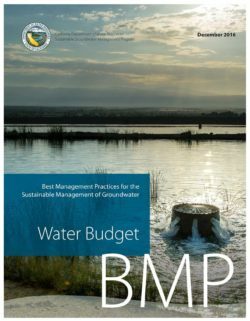 This BMP identifies available resources to support development, implementation, and reporting of water budget information. 1. Objective. The objective and brief description of the contents of this BMP. 2. Use and Limitations. A brief description of the use and limitations of this BMP. 3. Water Budget Fundamentals. 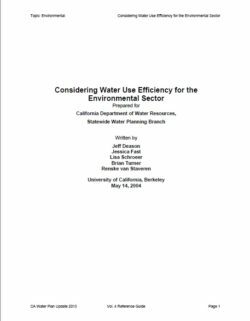 A description of fundamental water budget concepts. 4. Relationship of Water Budgets to other BMPs. A description of how the water budget BMP relates to other BMPs and how water budget information may be used to support development of other GSP requirements. 5. Technical Assistance. A description of technical assistance to support the development of a water budget, potential sources of information, and relevant datasets that can be used to further define each component. 6. Key Definitions. Definitions relevant for this BMP as provided in the GSP Regulations, Basin Boundary Regulations, SGMA, and DWR Bulletin 118. 7. Related Materials. 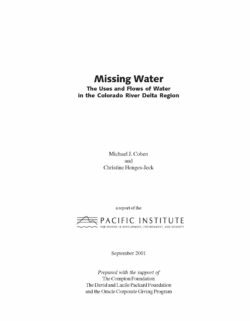 References and other materials that provide supporting information related to the development of water budget estimates.